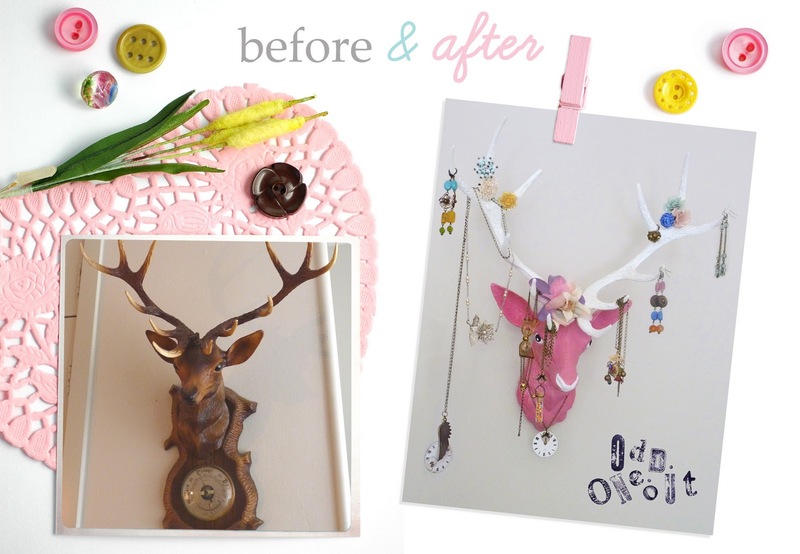 Odd One Out: Before & After - Mr Stag gets a makeover! Well this before and after is not a recent one, but I thought I would share it with you - as I get so many people asking me where I got the pink stags head that features in one of my postcards. We had been collecting these retro French plastic stag head / barometers for some time, and I always thought that they would be really cool for hanging jewellery off. The thing is - they are not very pretty and I didn't think that they would go with the style of my bedroom very well as they were. So a bit of dissection and a quick go-over with some spray paint, followed by a touch of hand painting and his make-over was complete! Or should I say his gender re-assignment - he does look very pretty now but I still call him Mr Stag! He does make such a cute model for my jewellery range don't you think! And here is is again hanging on the wall of my bedroom. 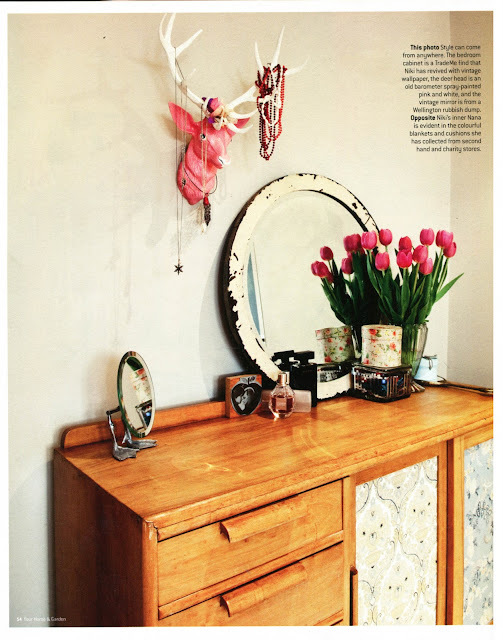 I promise in real life it is not this tidy - and Mr Stag usually has a heap more jewellery to contend with. This pic was taken when my home was featured in the August 2009 Your Home & Garden Magazine - hence the minimal (well minimal for me!) decor. Thanks to Pugly Pixel for the cute photo template! I love that he is still Mr Stag. I wonder if he'd like a coffee with Mr Coyote?? ?